Your perfect vacation awaits at this extraordinary lakefront home in exclusive Waterfront Greens. With 6 spacious bedrooms, each with king bed and private full bath, you’ll have plenty of privacy while enjoying this luxurious home, including two stacked stone fireplaces, soaring 2-story great room & elegant decor. Relax on the huge lakefront deck or screened porch with direct views of quiet North Glade Cove, where the included private dock slip awaits your boat. Included in your stay are all the amenities of Waterfront Greens, like FREE GOLF on the challenging par 3 golf course, free mini-golf, stocked 4-acre fishing pond, tennis courts, private road and trail system for walking, jogging & biking, plenty of room for the kids to run and explore, & a sledding hill. And you are just minutes from Wisp ski resort and all the activities of Deep Creek Lake. Ideal for couples, groups and families, this home offers the perfect combination of privacy and activities available nowhere else at the lake. Location on the Lake: The home is located at the end of North Glade Cove, a quiet, secluded area of the lake. The lakefront area where the dock slip is located is accessed by a short path to the water. Guests must use only Boat Slip #32, please do not use any other boat slips as they owned by others. North Glade Cove is ideal for all types of water activities, including swimming, kayaking, canoing, sailing, jet skiing or motorboating. Guests may fish in the lake from the shoreline only, please do not fish from the dock itself. You can obtain a Maryland fishing license or non-resident permit at any of the state parks in Garrett County, at Walmart in Oakland, and also at Bill's Outdoor Center and Deep Creek Outfitters. A permit or license is required for fishing in the Waterfront Greens catch-and-release pond. Minors younger than 16 may fish are exempt from permit requirements. The Golf Course: Waterfront Greens is unique at Deep Creek Lake as the only development with its own private golf course. Our home faces the golf course on the front side of the home, and faces the lakefront on the back side of the home. So, no matter where you choose to relax, you have a wonderful view from one of our decks. If that is not enough, the screened porch has views of both the golf course and the lake. The golf course is a 9 hole, par 3 course that is set up in the Scottish links format, with tall natural grass hazards separating the holes and providing an additional challenge to players. The length of the holes varies from about 130 yards to about 190 yards. There is no charge to play the golf course for Waterfront Greens guests. There is also a putting green for practicing your putting stroke, and a fun 18 hole mini-golf course near the clubhouse. Bring your own putters and golf balls for mini-golf, these are no longer available in the clubhouse. Other Activities: Two tennis courts are available for the use of Waterfront Greens guests. Also onsite is a well-stocked 4 acre fishing pond (catch & release). There are so many fish that they literally jump onto your line, great fun for kids of all ages. There are gazebos lining the pond for relaxing while others fish. The community has an extensive private road system and walking trails that provide great walking and enjoyment of the mountain air and scenery, without fear of traffic. In the winter months, you'll love the sledding hill, providing good old-fashioned sledding fun, again without fear of traffic. Also, we have a quality basketball hoop at the home with plenty of court space for a real game. A maximum of 6 cars are allowed. Additional vehicles can be parked in the guest spaces on Lakefront Links Drive next to the golf course (subject to availability--first come, first served). FREE NETFLIX! 65' LED Smart HDTV with Blue-Ray & Netflix in the great room. 60' LED Smart HDTV with Blue-Ray & Netflix in the lower level great room. 32' flat screen LED TV's in each bedroom. Blu-Ray players in both great rooms. One DVD/VCR combination in a bedroom. Wireless Internet is included. There are a total of 8 TV's in the home, one in each bedroom and giant Smart HDTV's in the great room on the main floor and lower level game room. All TV's are new Vizio flat screen LED TV's. There are 2 Blu-Ray players and 1 VCR. There is a stereo system including CD player in the great room and lower level great room. The main fireplace is a true masonry woodburning fireplace, with a stacked stone chimney that rises over 20 feet high in the soaring great room. The home has designer decor and many special touches that guests rave about. Outside, there is a hammock in the warm months, as well as pub table and picnic table on the lower level patio. The back deck is gigantic and fully furnished with chairs, lounge chairs and tables. There is a gas grill on the back deck. On the front side of the home, there is a delightful front porch with comfy chairs and small tables overlooking the golf course, perfect for relaxing after a round of golf. This home was nearly perfect for the group we have. Every room had a king bed and a master bedroom which is rare. 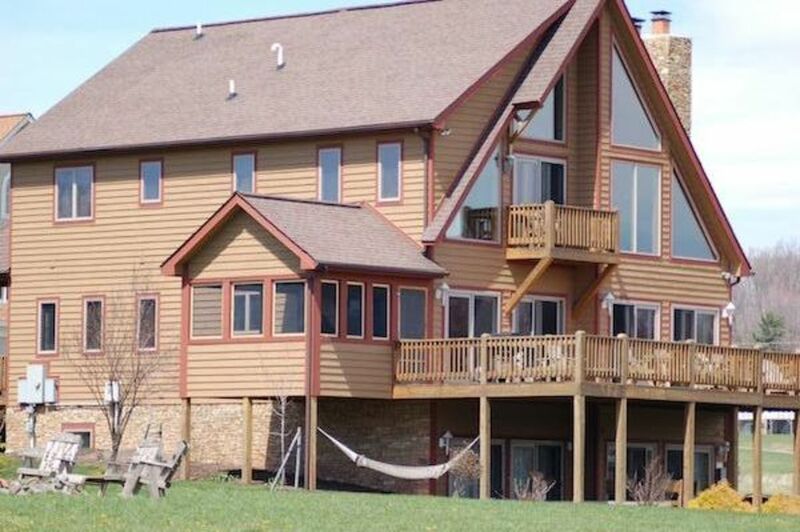 The home is within walking distance to the lake, so feel free to take a boat ride to the house. We were disappointed that the wireless access point was open, which is a little scary when half of the groups works as information security professionals. The basketball goal that is damaged and should not be part of the amenities until fixed. The owner worked with us very well. It allowed us to have one of the most enjoyable retreats we've ever had, and this is our 6th consecutive year. Overall a pleasant stay. House generally clean. A few broken items with notice sent to owner. Locks on deck doors need tighten or replaced. Hot tub not used but very noisy. Our extended family of 14 stayed for the first time at this property this summer. We all loved the house and all the amenities it provided, especially the screened porch. We would definitely stay again!! This is a beautiful house in a nice quiet part of Deep Creek. It is close to anything that we wanted to do but far enough that we had no crowds and traffic. The house was comfortable, clean, very well equipped. Any cooking that we wanted to do, there was a pot, pan, dish or utensil for it. Each bedroom had a king size bed and it's own bathroom. We have rented many houses at the lake and beach and this one is in our top 3. We highly recommend this property! Great accommodations for a weekend get a way for 6 couples! The house was really nice, we loved the fact that everyone had king size beds and their own bathroom! Definitely like to visit again! Deep Creek Lake is one of the last, great getaways on the East Coast where the pace of life remains slow, yet also offering world-class activities for all seasons. In the warm months, boating, watersports, sailing and fishing beckon, with the beautiful lake providing fun and scenery beyond compare. In fall, the spectacular foliage makes the lake area one of the premier destinations in the East. In winter, nearby Wisp Resort provides all the skiing, snowboarding, snow tubing and winter fun you can handle. Truly a year-round resort, Deep Creek Lake offers an unmatched combination of relaxation and activities for all ages. Waterfront Greens, in turn, is the finest destination in the Deep Creek Lake area. It is the only development at the Lake offering its own private, onsite par 3 golf course, included as part of your stay. Also available onsite at Waterfront Greens is a stocked fishing pond, tennis, mini-golf, hiking trails, sledding hill, clubhouse, lakeside gazebos and more. $300 security deposit is required. Base rental rates do not include state and local room tax of 11%. Cleaning is included. Linens and bath towels are included. Trash must be placed in the bear-proof container on the street. Sorry, we do not allow pets. Sorry, no exceptions to this rule. No parties age 25 or less or allowed. Occupants are limited to family groups only. No sororities, fraternities or non-chaperoned groups are allowed.